Son of man, set your face toward Gog, of the land of Magog . . . For in my jealousy and in my blazing wrath I declare, On that day there shall be a great shaking in the land of Israel; the fish of the sea, and the birds of the air, and the beasts of the field, and all creeping things that creep on the ground, and all the men that are upon the face of the earth, shall quake at my presence, and the mountains shall be thrown down, and the cliffs shall fall, and every wall shall tumble to the ground. This is the story of two brothers. One lives in Vermont, and the other lives in Utah. In a way it’s kind of a City Mouse/Country Mouse story, although since they both live in semi-rural situations, it’s more like Hill Mouse/Mountain Mouse, or Blue Ice And Bulletproof Crust Mouse/Smoky Powder In The Backcountry Mouse. You get the picture. Anyway, every year, at least once a year, the Vermont Mouse flies out to visit the Utah Mouse, who happens to be the U.S. Forest Service avalanche forecaster for the Bear River Range near Logan. It’s a treat for both mice — and not only because it gives them a chance to spend quality time together. The Utah Mouse gets a chance to show the Vermont Mouse around his favorite mountain range, and the Vermont Mouse gets to avail himself of his brother’s multifaceted expertise to ski some fantastic terrain in a remote, relatively untapped powder paradise. All in all it’s a pretty good deal, with the following complication: Both brothers have wives. These wives have produced scores of little mice, which means that there are delicate negotiations to be conducted, and strict timelines to follow. And the big mice never seem to be able to meet these timelines. So in addition to the usual hazards of back-country skiing in largely unexplored territory — avalanche danger, unpredictably long slogs, tricky route-finding and rapidly changing weather conditions — the two mice face serious dangers on the home front. So that our mice are not forced to continue laboring along in anonymity let us give them names: Tim (the Vermonter), and Toby (the Utah avalanche forecaster). On the day in question, another friendly mouse comes along for the ride: Darren McAvoy, a forestry extension associate at Utah State University. Darren also has a wife and a little mouse at home; moreover, it’s his birthday, and he and his wife have a babysitter and a reservation lined up at a very fancy restaurant. He’s pledged to return to Logan no later than 5:30, which means that the party must start down Logan canyon by five at the latest. The commitment is firm, he makes clear over the phone: no ifs, ands, or buts. Toby and Tim meet Darren at the trailhead at approximately 10:30. Despite the firm return time there doesn’t seem to be any rush, mostly because in his capacity as avalanche forecaster Toby has what some would say is an unfair advantage: a snowmobile. Unlike the Wasatch and other ranges, the Bear River Range is home to no major ski resort, and snowmobilers are more common visitors than backcountry skiers. As Toby’s job is to get the most accurate readings possible, his sled is indispensable. Those who ski with him tend to swallow their aversion to the hell-spawn two-stroke when they stop to think about what kind of access it can buy: the slopes our mouse-adventurers will be earning their turns on will see few if any other ski tracks this season. For backcountry skiers with or without snowmobiles the Bear River range is an unsung paradise: hundreds of square miles of pendulous Karst topography reminiscent of the Italian Dolomites, plenty of skiable lines winding down through pretty limestone spurs and outcroppings, a sunny but well-watered climate favoring robust and picturesque glades of sub-alpine spruce and Douglas fir, and abundant untracked snow, often in the form of that weightless Utah powder dumped by wet Pacific storms aerated like foamed cappuccino as they scud cross the arid deserts of the Great Basin. There is ample reason for caution in this Eden-like environment, as our mice will soon discover: plenty of steep angles for the snow to slab off, and a somewhat unique problem that leads to misjudgments of distance and scale: Because of the region’s fertility the trees grow bigger here than in other similar mountain ranges, meaning that distant vistas can look smaller and friendlier than they actually are. Above a certain altitude the snow on this lovely mid-March day is too light and deep for a snowmobile. Rather than wasting time digging out they decide to roll up the tow-ropes and put on their skins to begin the ascent. 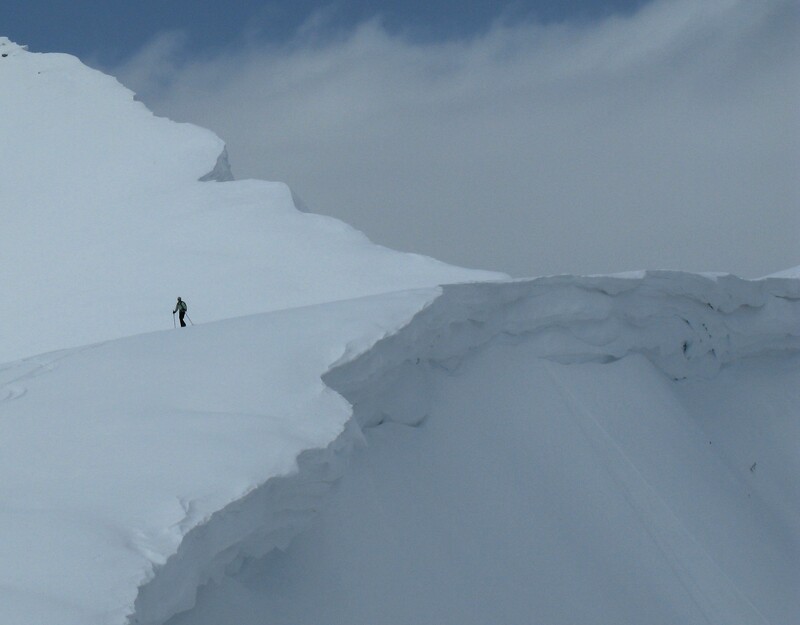 It takes a few hours to climb to the day’s first turnaround point, an unnamed ridge topped by a healthy cornice. The resident expert declares that the avalanche danger is low, and, one after the other, our happy mice take their turns, glorying in around a thousand feet of uninterrupted waist-deep Utah smoke on a rolling hillside open except for widely spaced copses of spruce and fir. For a few soaring moments each skier has a chance to savor the fierce euphoria that floating downhill through such a stirring natural landscape can awaken; that feeling of true oneness with the world, like what a hawk must feel riding the wind over forest and meadow. It’s now 3:30, time for one more lap if the mice are quick about it. Off to their left is a peak known as Gog, a Biblical name bestowed by early Mormon settlers who must have been impressed by the mountain’s forbidding cliffs and buttresses. If the mice follow yesterday’s half-buried skin tracks up the ridge there might be time to summit. Toby now admits that he’s had his eye on Gog for months; he thinks he may have seen a route down the eastern flank of the peak, a steep chute winding through the cliffs that has probably never felt the P-Tex caress of ski bottoms. If it does turn out to be skiable, he reasons, it could put the party closer to the sled, thereby saving a long slog across the flats and rolling ground that took up so much time on the ascent. Toby does not say it in so many words, but all this could simply be wishful thinking. It’s possible the rocky summit is farther away than it seems, and the short-cut to the sled is only theoretical. He’s only glimpsed the chute from a distance. It may be too steep to be safe to ski with so much snow on it, or the outlet it appeared to offer through the cliff-bands may prove illusory. But reality has seldom stood in these mice’s way before, and they skin off up the ridge full of carefree optimism towards the summit of Gog. If they decide not to ski the unnamed chute on the mountain’s eastern aspect, the reasoning goes, they can always bail and come back down to the gladed medium-angle slopes on the northwestern side. Left unspoken is the reality that if they take time to summit and then have to retrace their tracks, the slog out may take them well beyond the established deadline; as stated, none of these mice is particularly good with time management. In the back of their minds is a growing belief that the chute will go through and put them down close to the sled. As our mice will shortly learn, it’s not wise to underestimate a mountain named Gog. The first mishap occurs as they crest the narrow ridge leading to the rocky spire of the summit. Darren, the mouse most responsible for upholding the deadline, is energetically breaking trail, followed by Tim, the Vermont Mouse, and Toby. All afternoon Darren’s skin tracks have been well-placed and thoughtful, easy-to-follow zig-zags at doable angles going around any obstacles and following the best possible route. However, in one place where the ridge narrows to a knife edge Tim watches him struggle to get around a stout Douglas fir that happens to be blocking the path. He manages to muscle around the tree using its lower branches for leverage, but the end result is that there’s no skin track left; just the tree and an abrupt drop-off into a steep trackless chute. Tim does his best to get around the tree using Darren’s technique, but there’s no ground under his skis and he finds himself slipping sideways. His efforts to recover accomplish nothing but further undermining the snow in the chute, and in the end he is suspended over the void, hanging on a tree branch. If he were to let go, it’s possible he would find the steep chute skiable for the first fifty yards or so, but then, assuming he could stay up on his skis he would have to traverse, and having lost a great deal of vertical he would at the minimum kill party’s chances of reaching the summit and getting back at any kind of decent hour. No one panics. Toby finds a way around the tree and squats to reach as Tim hands him, one by one, his poles and then his skis. The Vermont Mouse is then able to hoist himself up by the tree branches to regain the trail, where he very carefully reattaches his skis. The party continues, but time has been wasted. By the time the party regroups on the summit of Gog, Darren’s 5:30 deadline is already a pipe dream. Nevertheless it remains in his interest, and in the interest of the Vermont and Utah mice, to get down as quickly as possible. There are still two options: pick their way back down the skin track along the rocky narrow ridge they have just ascended to the medium-angle glade on the northwestern side, or attempt the unknown chute on the steep eastern side of the mountain. The main advantage of the first option is that it’s a known quantity, predictable and safe; the disadvantages are that it will burn a lot more time and the mice will lose much of their hard-won vertical. The advantage of the second option (leaving aside the attractions of an adventure in uncharted territory) is its potential get them down to the sled quickly, saving them hours of slogging. The disadvantages remain to be seen. There is some token dialog weighing the options. The Vermont Mouse declares that he is too inexperienced to make a well-informed decision. The Utah Mouse tells the other two that he really sort of believes the chute goes through, though it is likely to be, in his words, “gnarly.” But the truth is that from the beginning there was very little question that the party was going to attempt the chute. And so, swallowing any trepidation they may feel, our mice set off one by one down a steep slot of untracked powder. It’s too steep to see what will unfold below them, but for whatever reason (or lack of reason) the mice are optimistic. And now they are committed. They regroup after the first long roll, where the chute narrows, finding a spot well to the side of any potential avalanches. Our mice are trembling with that unique mixture of exhilaration and dread that comes from being somewhere they probably shouldn’t be. The snow is deep, and this eastern exposure, as promised, is noticeably steeper than anything they’ve attempted over the last several days. The party has observed no natural avalanches, although on his official Utah Avalanche Center web-site Toby will later describe the day’s avalanche danger as “moderate.” That is, if avalanches are going to occur it will be on exactly the kind of steep slope they are about to ski. So they try to minimize the risk with good backcountry travel protocol, skiing one at a time and communicating often, the second skier waiting for word from the first before proceeding, and so on. They still can’t see the terrain immediately below them — the slope is far too steep for that — but they can see their goal, the low-angle run-out at the bottom of the mountain leading to the safety of the aspen glades where — somewhere, they can’t see it — the snowmobile is parked. After the next passage, a winding chute, the slope angle turns gut-wrenchingly steep. The mice, regrouping again, look at each other with helpless alarm. But there’s nothing for it: they’re committed to the line. At this point trying to skin up might be just as dangerous as continuing down. On the positive side of the ledger, the flats at the bottom of the run look close enough to reach out and grab. What’s worrisome is the part of the mountain still to come between the skiers and the flats. Darren goes first. After a few minutes an indistinct shout comes up from below. His voice does not seem distressed or panicked, so Tim follows, a little nervous but skiing fine down through a steep narrow chute curving gradually to the left. Darren has taken cover at the bottom of the chute in the only available safe haven, a narrow strip of Douglas firs perched on a small strip of high land between two distinct avalanche paths. Tim skis in below him and waits at the lower end of the copse behind a solid-looking tree. Darren is troubled; he saw shooting cracks in the snow halfway down the chute they’d just skied. He doesn’t tell Tim about it yet, perhaps to spare his feelings while they wait for the expert to come down. Meanwhile, they take a preliminary look at what’s to come. Immediately below is a broken limestone fringe marking the top of the cliff band that anchors the eastern base of Gog. There seem to be two possible routes through it: a narrow chute to the left and a slightly wider one to the right. Both are so steep that it’s impossible to judge whether they go through, or simply end in cliff. Weirdly, the flats that represent the goal, safety, escape, freedom, seem to have grown more distant as they have descended. How can that be? Gog is playing games with our mice, like an enormous and potentially very deadly cat. It’s that scale problem again. “Okay. I’m behind a couple of pretty big trees. Come on down.” Darren makes a turn and tucks himself behind the tree in front of Tim’s. “Should one of us go down to that snag at the edge of the cliff and see if we can get a clearer view?” Tim asks. Tim and Darren lean uphill into their trees, grabbing hold of the strongest-looking branches available. In the next moment the steep gully to their left is filled with a slow-motion torrent, a languid white tongue of broken snow sweeping down the chute. It comes to a stop at the edge of the cliff, burying the bottom three feet of the snag Tim had just suggested using for a look-out point. But it’s a relatively minor avalanche; everyone is safe. The angle is so steep that on the return traverse he starts sliding sideways down the drainpipe, barely making it back to the strip of firs. This is somewhat difficult for the others to hear. Toby is the expert, the one they’re depending on, not only for expertise but as an inspiring beacon of confidence. If he’s feeling this way, they must really be in trouble. The fact is that there’s no option left but to take the chute to the skier’s right, a steep plunge into the unknown. Again, they could try to skin back up the way they came, but that in itself would be a huge risk given the amount of vertical and the slope gradient, and it would mean being out on Gog well into the night. Whereas, if the chute does provide an outlet through the cliff band, the three little mice could be out on the flats and on their way down to the sled in minutes. Toby, already having assessed these options, dutifully steps up to the plate. The other two watch tensely as he crosses the avalanche rubble and disappears into the righthand chute. There’s a long wait, then a faint scream comes up from below. Is it triumph, or agony? Darren doesn’t pause to analyze; he pushes off and in seconds he too is swallowed up by the chute. A few minutes later another scream comes wafting up from below. Tim fidgets nervously by his tree. Could the screams of his partners have been their final warnings as they plunged over a cliff? Or were they the vocalized expression of intense relief for the deliverance he too so desperately craves? There’s only one way to find out. He almost loses his balance in the avalanche rubble, but recovers in time to muscle a string of turns through the steepest part of the chute. He keeps looking over his shoulder, half-expecting a huge torrent of snow to come rushing down and overwhelm him. But it doesn’t, and before he knows it the chute has opened up and he’s following the others’ curving leftward tracks onto the flats and out of danger. In the parking lot, as Darren shakes the others’ hands before jumping in his car, his face shows the stress of a mouse who is late for a very important date. It is a stress, however, mixed with the unmistakable jubilation of having narrowly evaded the clutches of Gog, one capricious predator of a mountain. As for the mouse brothers, Vermont and Utah, this is the third day in a row they’ve stayed out later than they said they would. Their wives are not pleased, but neither are they surprised; over the years the brothers’ tardiness has become a habit nearly as predictable as the sunrise. After the little mice are in bed, over a beer and a late dinner, the brothers do their best to explain themselves: how they really did want to get down on time; how they really thought they could, but things just didn’t work out that way. How they are actually pretty lucky, by the way, to have escaped with their lives. The wives aren’t buying it. In their view the mouse brothers knew very well what they were getting into, went ahead and did it anyway, and will almost certainly behave exactly the same way next time. And you know, the wives probably have a point. This essay originally appeared in Off-Piste magazine.